Two weeks ago, I attended the Whitehot’s Children’s Book Display at the Mississauga Library. I was able to speak to publishing reps about upcoming new releases and get the scoop on the best reads. I asked the rep from Sterling Children’s Books for his top pick of YA titles and he immediately picked up Envy by Gregg Olsen. The book cover itself is a high selling point, but at the same time scared me because it reminded me of the scariest movie ever- The Ring. Yes, I am still terrified of that film, and really haven’t watched a horror movie since. Luckily, Envy isn’t so much a horror story as it is a suspenseful mystery. I must admit, the story kept my interest. But I’m not sure it’s because of Olsen’s story or the fact that I knew the book was based on the true case of Megan Meier. If you aren’t aware of the case, Megan was 13 years old when she committed suicide after being cyberbullied by an unlikely individual. The case was highly publicized and shed light on the dangers of social media. – This book had some of the worst cliffhanger lines ever. For example—When Katelyn is found dead in a bathtub with an expresso machine, Olsen writes: [someone in Port Gamble was] “loving the sad moment to the very drop”. I also found that Olsen loved writing short empathetic sentences. For example, he ends a chapter with “…beginning of something that would change everything. Everything. Every. Single. Thing (p.16)”. The majority of chapter endings were so terrible that I was surprised there wasn’t a dramatic ‘duh duh duh’ written after them. – I think Olsen tried too hard to reference popular culture. From Twilight, to Smashbox makeup. Yes, it may be in ‘in’ thing now, but in a couple of years, these references will date the book. – Umm…did I miss something? Why exactly was the espresso coffee machine even near the bathtub in the first place? – SPOILER— I didn’t buy the ending. Once they found out Katelyn’s death was an accident, it was like ‘ohhhhh okay, no problem, it was an accident, end of story’. The storyline of Katelyn was pretty much dropped there. Then, the next chapter thrusts us back into Hay-Tay’s supernatural issues and the annoying reporter Moira. Yes, she was a little crazy stealing their dog and all, but did she really need to be murdered so that the twins could be ‘protected’? I really doubt being ploughed down by a car would look the same as falling down a rocky bank. To be ruled ‘accidental’ Port Gamble must have the worst policemen and coroners in the world. -I liked the supernatural ‘special’ powers between the twins and wish that it was a bigger part of the storyline. However, the ending of Envy does suggest that their powers will be more played out in the series. -I enjoyed reading a mystery and searching for the clues within the story to try to understand what really happened to Katelyn. -I appreciated the fact that Olsen addressed the issue of online anonymity and the dangers of cyber bullying. Today kids are so tech savvy and cyber bullying is sadly becoming a more prevalent form of bullying. Or visit www.emptycoffinseries.com for more information on the book and cyberbulling. You can even take a ‘how mean are you?’ quiz! 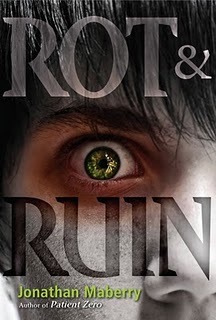 It’s no secret that I love YA dystopian novels, and the zombie infested, post-apocalyptic world of Rot & Ruin by Jonathan Maberry didn’t disappoint. The book gained attention after being selected for the ALA Best Books for Young Adults and the winning the 2010 Cybils (Children’s and Young Adult Bloggers’ Literary Awards) in the Fantasy and Science Fiction category. Although Rot & Ruin is my first zombie read ever, it won’t be my last! The Forest of Hands and Teeth has been on my ‘to-read’ list forever, and thanks to my new interest in zombies, I will be bumping up the title closer to the top. So what’s it about you ask? After the First night (the night the world changed), Benny Imura has grown up in a zombie-infested town with his older brother Tom. To avoid a ration cut, Benny is forced to find a job. Among other jobs, he tries his hand as a lock smith, fence tester, and carpet coat salesman. Ultimately, he ends up apprenticing as a zombie hunter with his brother. After Tom brings him into the ‘rot & ruin’, he begins to understand that zombies were once human and this realization ultimately changes the way he views zombies and his brother. – Enjoyed the book’s visual appeal. The front features a creepy eye-catching cover, and the inside includes zombie-cards (a strong feature of the story). There is even a ‘zombified’ author portrait by Rob Sachetto. This is neat because the character responsible for such portraits in the story is named after the real artist, Rob Sachetto. -Blood and gore. As a zombie novel, I was expecting some level of gore but I must admit that some of the descriptions made me a little queasy. I’m hoping my gore tolerance will increase as I read more zombie type stories. -I really liked the concept of Tom’s closure jobs. -Preachy Tom. I get that he is supposed to be the smart, wise, older brother, but a little less preaching to Benny would have been appreciated. -Tom +Benny’s relationship. I think that their relationship was pretty realistic. I can see why there is some hostility between the brothers in the beginning, but readers get to watch their relationship evolve for the better throughout the storyline. -After reading Divergent where most of the storyline was based on training, I felt like Benny really didn’t receive much training at all. I’m not sure how he felt ready to even venture out into the rot & ruin. He truly lacked in depth-training from Tom that would have been interesting to read about. -Changed mindset. Like Benny, I view zombies differently now. I never thought it would be possible to have empathy for flesh eating zombies, but Maberry totally altered my perception of what it means to be a zombie. Throughout the story, it is banged into your head that zombies were once humans. -Zom/Tom. I was annoyed that the word Zom and Tom happened way too many times in the same paragraph. -I’m still confused on why everyone turned to zombies when they died—even if it was by natural causes? Why? How did the zombies really ever come to be? There was very little explanation! Despite all my negative comments, I still enjoyed Rot & Ruin. If you like zombie stories, I would suggest you pick up this book. The book’s sequel is entitled, Dust & Decay and was released a couple of weeks ago. It promises bigger, better, gorier zombie attacks. At our last Father/Son Bookclub the boys chose Diary of a Wimpykid: Dog Days and absolutely loved it. Since it was my turn as the moderator to choose the next book, I wanted a read-alike that would appeal to my grade 4-5 boys. I selected the junior fiction book, Cheesie Mack is Not a Genius or Anything by Steve Cotler after reading some positive reviews. The humorous book was about Ronald ‘Cheesie’ Mack retelling the crazy events leading up to his grade five graduation. Cheesie began with Chapter 0 (The Story is Over!) where he informed readers that the story was about a “mysterious old coin, an evil sister, a dead sister, runaway rodents, a super-best friend, a fifth-grade graduation disaster, some really unusual words… and The Haunted Toad (pg1).” Sounds awesome, right? Well it was… yet I am still so incredibly peeved at the amount of times the CheesieMack website was promoted that I find this review difficult to write. It seemed like every page had ‘if you like this or have something to add… please go to my website CheesieMack.com and let me know!’ Ughh- I just wanted to scream, enough already! We get it! I’m sure there could have been an equally effective way of promoting the website without having it so ‘in your face’. I can’t wait to talk to the boys to see if they were equally annoyed and if any actually checked out the website while reading the book. -As a librarian, I love when a book teaches readers new vocabulary words in an interesting way. When Cheesie added and defined new words, it never felt forced. -Tween boys will enjoy this book. The storyline was fun and humourous (such as Cheesie’s invented words like scoogled- scoot and wiggle). Another aspect that will appeal to boys was the addition of several visuals, including black and white illustrations and lists. When Cheesie used lists and bulleted points, it added a visual element that changed up the words from the standard text. While Cheesie Mack is no Wimpy Kid, I think it will satisfy its target audience. Those that loved the book will be happy to know that Cheesie Mack is being turned into a series, with the second book, ‘Cheesie Mack is Cool in a Duel’ to be released June 2012. For those that can simply not wait for the next release, you can always check out the CheesyMack website! HA! First off, I can’t believe Divergent is a debut novel by talented writer Veronica Roth. On top of that, she wrote the majority of the book in college at age 22! I’m extremely jealous of her creative writing ability. Thank goodness the story will continue in Roth’s follow up called Insurgent due out May 2012. Divergent is all about choices and making decisions. 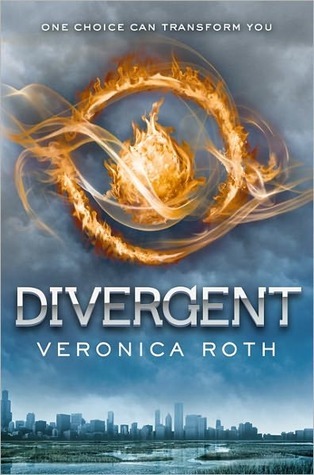 Beatrice “Tris” Prior has turned sixteen, the age in which teenagers living in Roth’s dystopian Chicago must make a decision whether to stay with their families or have the courage to choose the virtue (and faction) they most believe in. The factions are divided into: Candor (the honest), Abnegation (selflessness), Dauntless (daring), Erudite (knowledgable) and Amity (peaceful). Roth explains, “It has been this way since the beginning of the great peace, when the factions were formed. I think the system persists because we’re afraid of what might happen if it didn’t: war (p.33).” This explanation confused me. Dividing individuals up based on differences is completely illogical and just asking for war to break out. Looking back at our own history is proof— if this story takes place in the unknown future, shouldn’t they have learned by now? I really hope Roth gives more information about how and why the factions came into existence in the next book. The majority of the book is dedicated to Beatrice’s initiation into her faction and undergoing intense emotional/physical trauma. I thought it dragged on, and I started wondering when the story was really going to pick up (in the last 100 pages). In terms of the number of pages (487 pages), it is formatted so there is a large amount of white space, so it isn’t quite as long as it appears. I loved the main character, Tris. We are able to watch Tris develop gradually throughout the novel by overcoming her fears and learning to maintain balance between her old and new life. She’s one tough gal. Divergent is a gripping, intense, original book. I know I will be recommending Divergent to those that are looking for something to fill their Hunger Games void. Like Hunger Games, I think it would also appeal to both male and female readers. I enjoy when romance isn’t the focus of the storyline, and this proved true in Divergent. I won’t give too much away, but it’s a very sweet and surprising romance. While I did pick up on Four’s big plot twist the first time I read Divergent, I know I missed some things and am currently re-reading it. I rarely re-read books because I have tons of my ‘to-read’ list, so this in itself says a lot about the book. Read the first 100 pages available free!